While several significant changes to First National Bank’s popular eBucks rewards programme kick in this month, the tightening up of earn rules across all accounts means that rewards are now capped at far stricter levels. Certain behaviour (such as holding products or performing certain transactions via specific channels) earn customers points which then determine which reward level they are on for the following month. eBucks are then earned on certain types of spending, depending on reward level. For example, a Premier customer on reward level five will earn 15% back in eBucks on their spend at Checkers/Shoprite, while one on reward level three will only earn 5%. Regardless of their reward level, however, monthly earning is capped across all categories. It’s these limits that FNB has tightened substantially from July. For Premier (previously Platinum) customers, this means a reduction in potential eBucks earned of anywhere from 33% to 80%. For Private Clients account holders, the drop is between 16% and 78%. The steepest reduction is for in-store shopping at grocery partner Checkers/Shoprite. Until June, Premier customers could earn eBucks on their first R10 000 of spend at Checkers/Shoprite stores in a month (or 20% of their total qualifying monthly spend). 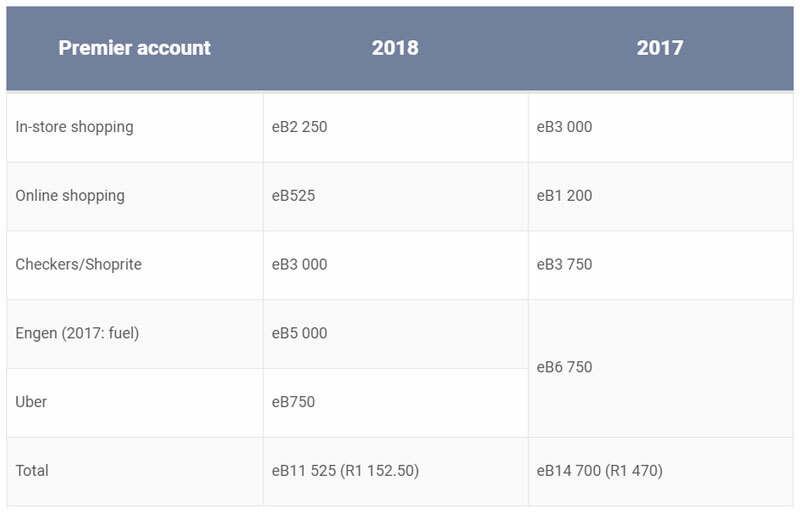 Realistically, hitting that R10 000 base was difficult, especially since the 20% of total qualifying spend rule was also in place (you’d need to spend R50 000/month on your cards to hit the limit). The new cap is 80% lower, at just R2 000/month (while the 20% of spend rule remains), which translates to maximum earnings of eB3 000. This means that a customer will only earn the higher percentage of eBucks (up to 15%) at this partner on effectively a large monthly shop from July. Thereafter, any spend at Checkers/Shoprite will fall into the in-store shopping category, at an earn rate of just 2% on a credit card (at reward level five) and 0.25% on a cheque card (regardless of level). On in-store shopping, the limit has been halved to R10 000/month, whereafter customers will earn a flat rate of 0.5% back in eBucks. The amount of eBucks customers earn on each litre of fuel has increased from July because of how rewards are calculated. Instead of a percentage earned on total fuel spend, customers will earn up to R4/l back at Engen fuel stations only. This means a 45l tank-fill will earn eb1 800 (R180) at reward level five, from around eB1 065 (R106) currently. Here, the monthly cap has dropped from R4 500 for fuel and Uber trips to just R2 000 for fuel at Engen (or 20% of total spend). At current prices, customers will only earn eBucks on three (45l) tanks of fuel a month: a maximum of eB5 000 (despite the petrol price). 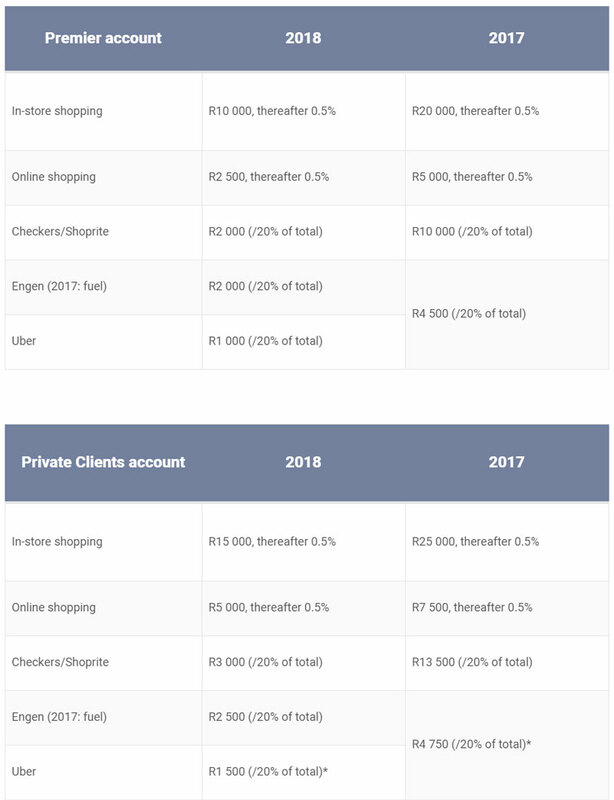 Let’s consider a hypothetical level-five Premier customer who does R15 000 of in-store shopping (via credit card), R3 000 of online shopping (also credit card), R2 500 spend at Checkers, about R4 000 fuel spend a month (180l), and has R500 of Uber bills. With the new limits (providing they don’t hit any 20% of total spend caps), they’ll earn just over 20% fewer eBucks than before at the same levels of spend. This is significant. These lower limits mean a far lower amount of potential payouts that the bank will have to make via eBucks. Those households that shift the majority of their spend through a single account ­at the highest reward level to get the maximum amount of rewards — an old “trick” to max out reward potential — are surely unhappy. 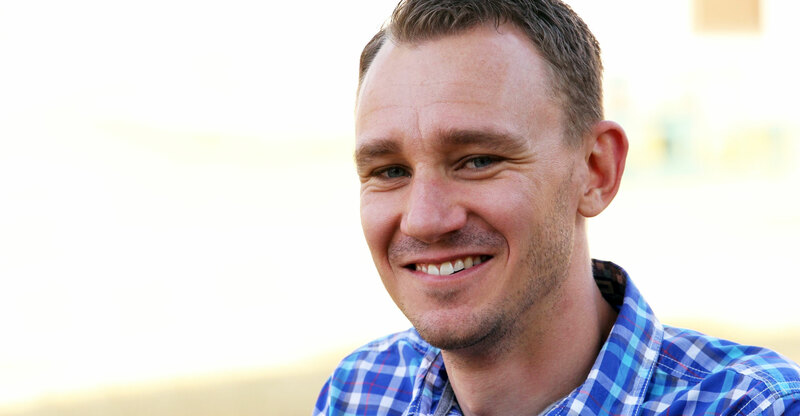 And customers (like this author) who are on an atypical account type (such as Gold, but should be on Premier, or Premier, but should be on Private Clients) will also be affected by this change as their spend will generally easily hit the reward caps.